Join us as we walk the warm, sandy beaches and the glistening ocean laps at the shoreline and help us bid a warm Aloha to the new Tropical Paradise Collection! Further your equatorial escape with realistically shaped plumeria flowers most commonly known for their inclusion in traditional Hawaiian leis boasting blossoms in pinks, whites, reds and yellows amid their large, leafy foliage. Discover the unique and breathtaking birds that call this exotic place home, from toucans to parrots, flamingos and cockatoos which have all been beautifully illustrated and assembled into three dynamic cling stamp sets and coordinating dies! Filled with bright and vibrant colors, the exquisitely designed paper collection will transport you to a tropical island with its fiery sunset reds, dazzling sunny yellows, deep ocean blues and rich leafy greens! Heartfelt Creations invites you to slip away to utopia with the new Tropical Paradise Collection! Escape to an exotic paradise where the air is warm, lush rainforests are filled with the calls of outlandish birds of paradise, and the day begins and ends with the most spectacular array of colors! Mowed Lawn & Mermaid Lagoon Distress Inks, Versamark ink, Ranger Heat-it-Tool, Ranger gold embossing powder, Koi Waterbrush, Gansai Tambi Watercolors, Ebosser, Martha Stewart scoreboard, Spellbinders A2 Divine Eloquence die, Memory Box Heartwood Stencil, Clarity Brushes, white & watercolor cardstock, ribbon, rhinestone & adhesive. Take a 4 1/4" x 5 1/2" white card base. Cut a piece of slightly smaller pattern paper from Tropical Paradise Paper Collection and glue it down on the card base. Die cut a piece of white cardstock with the largest die from Spellbinders A2 Divine Eloquence die. Ink it with Mowed Lawn Distress Ink using Memory Box Heartwood Stencil & Clarity Brushes. Wrap & adhere a piece of green ribbon on the bottom edge of the die cut as shown. Glue this die cut on the pattern paper. 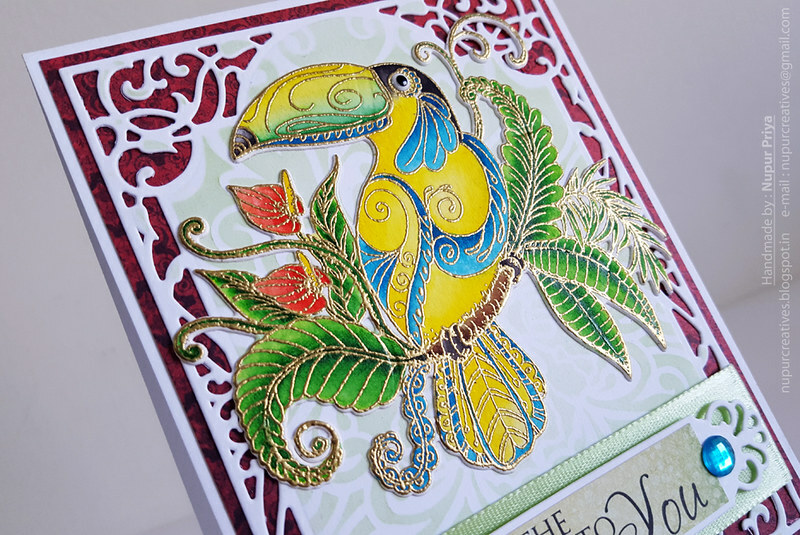 Take a piece of watercolor cardstock & stamp the image from Tropical Parrots Cling Stamp Set with Versamark ink & heat emboss it using Ranger Heat-it-Tool & gold embossing powder. Color it using Gansai Tambi Watercolors & Koi Waterbrush. 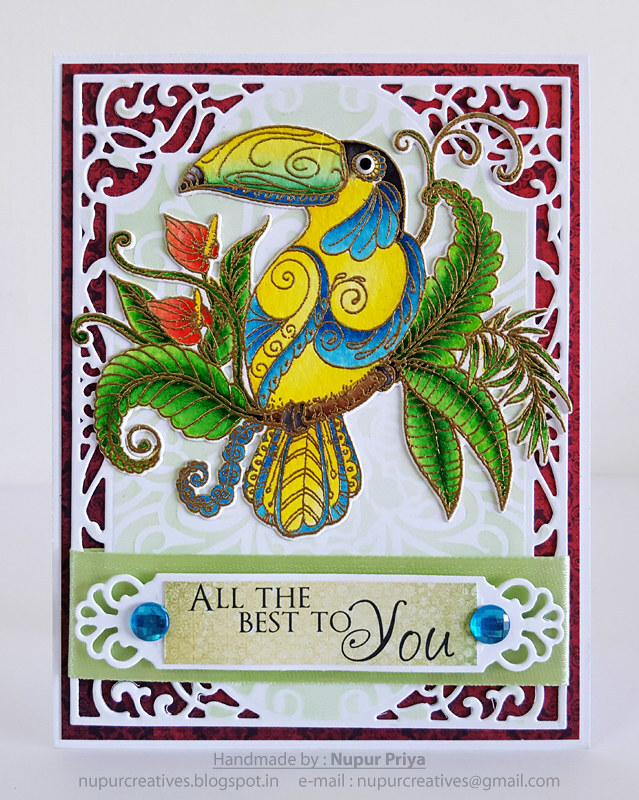 Die cut this image using matching die from Tropical Parrots Die & adhere to the card front. Use Nuvo Crystal Drops - Gloss White & Ebony Black to make the eyes. 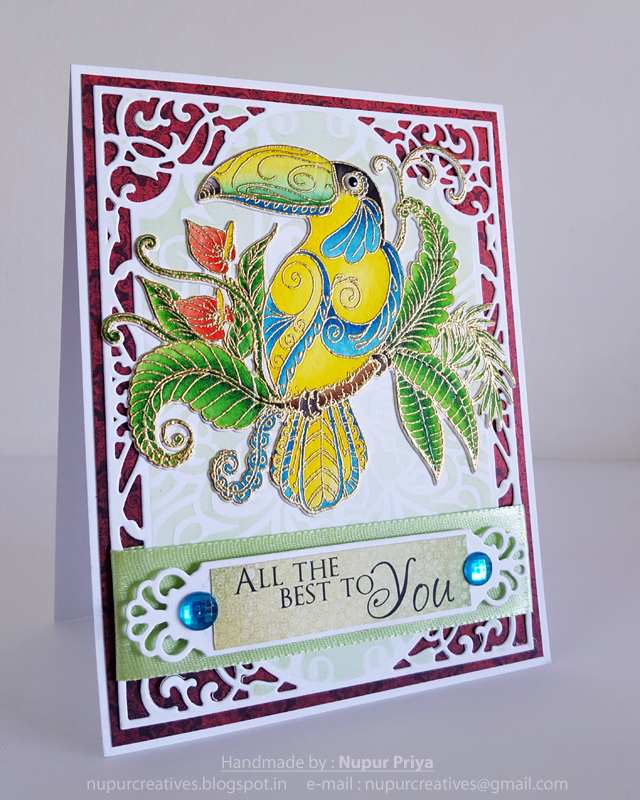 Cut a piece of sentiment from the Tropical Paradise paper collection and glue it to a white cardstock die cut with the label die from Spellbinders A2 Divine Eloquence die. Adhere it on the ribbon with foam adhesive. Add some rhinestones to add finishing touch to the card. the gold embossing really highlights your coloring, love this. Just look at this beauty! I love the embossing! Love your gorgeous card. The gold embossing really makes it pop!